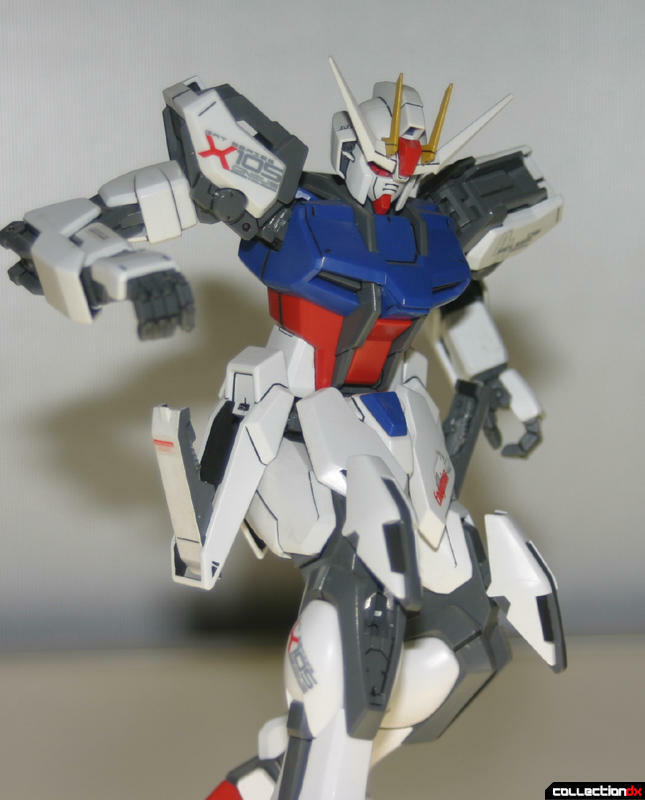 Around a year and a half ago, before I built the Master Grade version of the Freedom Gundam from Gundam SEED, there was the GAT-X105 Strike Gundam, Bandai’s first installment of the SEED franchise in Master Grade form. Bandai’s infamous Master Grade line of Gundam models has forever and a day been dominated by machines from the original Gundam universe known as the ‘Universal Century.’ Variants such as anything “Char” and Side Story machines aside, there have only been a few kits to come from the ‘Alternate Universe.’ These AU series are the stand alone Gundam tales that have been fortunate to receive Master Grade kits as well include G-Gundam, and the Wing Gundam Zero from Gundam Wing. 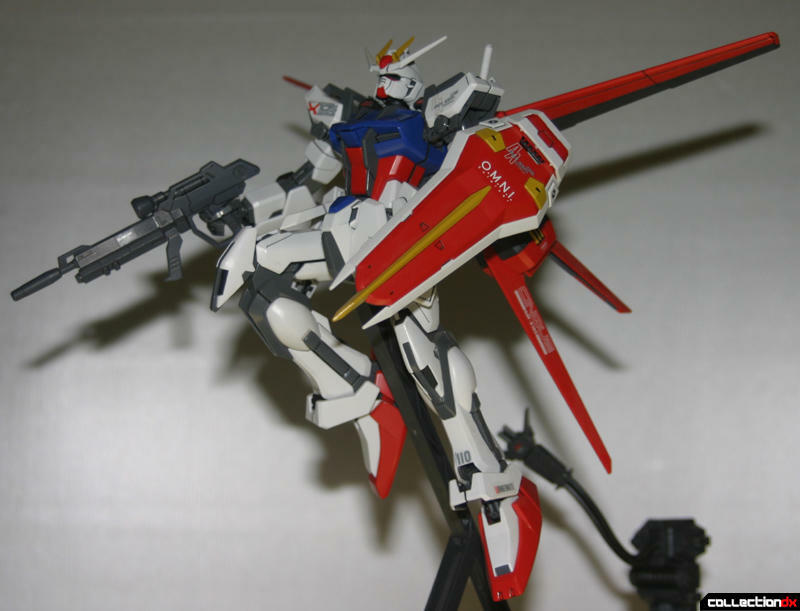 Joining their ranks is the Strike Gundam from Gundam SEED. 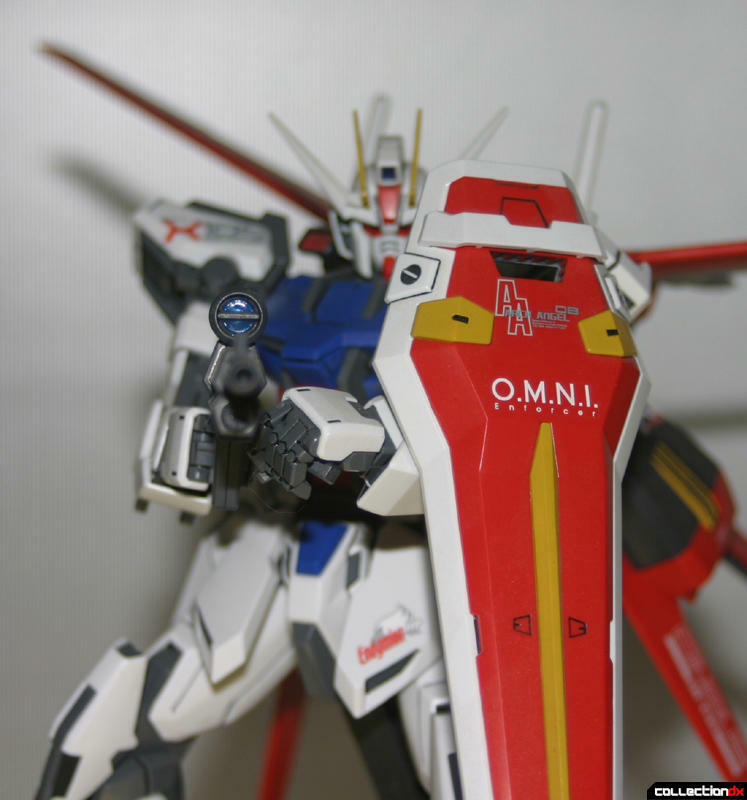 Following the tradition of the Gundam name brand, Bandai capitalized exceedingly on the popularity of Gundam SEED with model kits. With a total of three 1/144 low grades, one 1/144 high grade, three 1/100 scale High grades, and its 1/60 scale the Strike needs no introduction. However since Master Grade is more of a status than any other model, the Aile Strike had to stand out as something different than its previous incarnations. 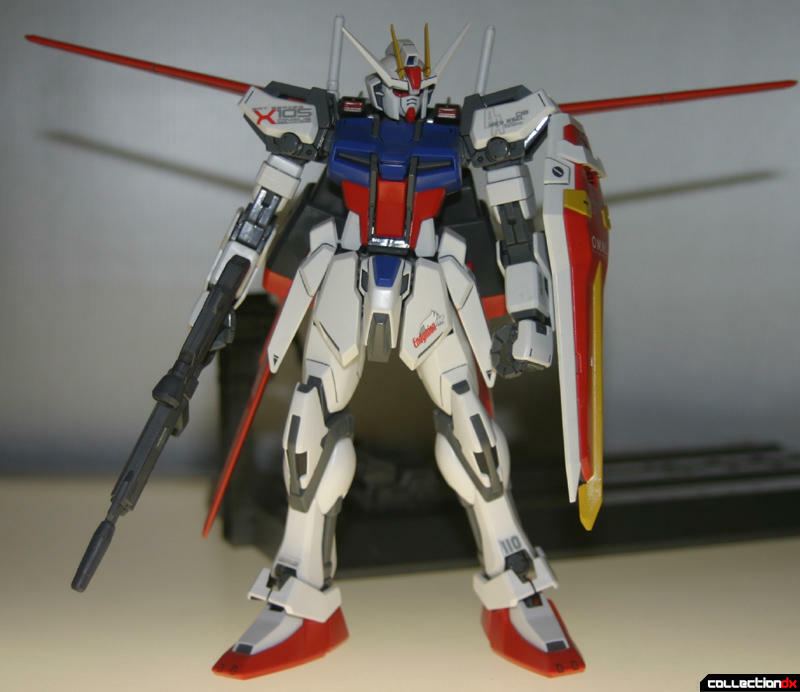 The Strike Gundam is the first Gundam declared for Bandai’s last generation of the franchise: Mobile Suit Gundam SEED. Set in its own universe of the Cosmic Era, SEED seemed to most as a ‘rehash’ of the original Mobile Suit Gundam series. The normal, terrestrial Earth Alliance against the forces of ZAFT and its space dwelling super-advanced “Coordinators” in a bitter genetically driven Civil War. Neither side was greater than the other short of ZAFT’s technological superiority with the development of Mobile Suits and the Neutron Jammer, a device capable of eliminating Nuclear power sources, thereby crippling the Earth Alliance. A few years into the war, in a cooperative effort between the Earth Alliance and the neutral colony Heliopolis and produced through Morganrate, the Alliance began producing its own mobile suit forces. However in a cunning attempt, ZAFT successfully captured four of the experimental mobile suits, save for one. 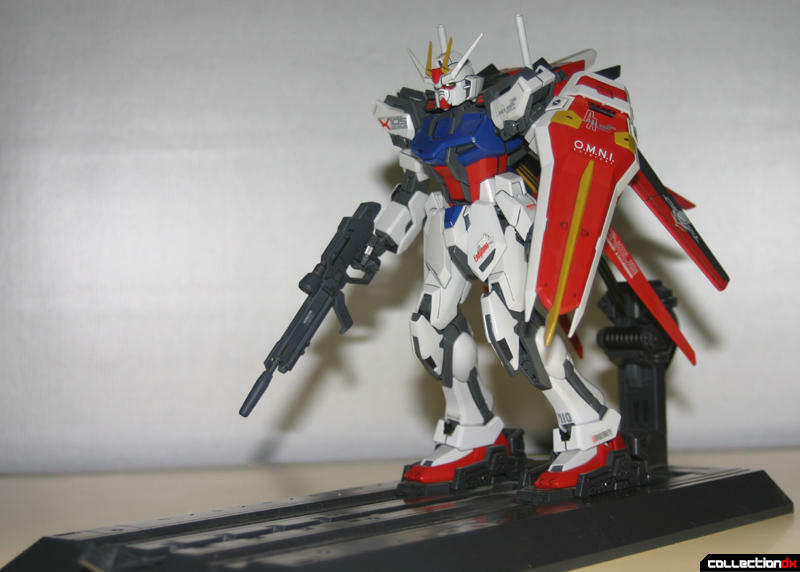 The GAT-X105 Strike Gundam, piloted by Kira Yamato. Using a minimal amount of weight and sticking to the character value of the Strike Gundam, the MG Aile fills its role very well. Construction is simple but uses just enough parts to do the job. The model stands very sleek and slender which is a complete contrast to the rounder, more “clunky” looking version like the 1/100 scale High Grade. 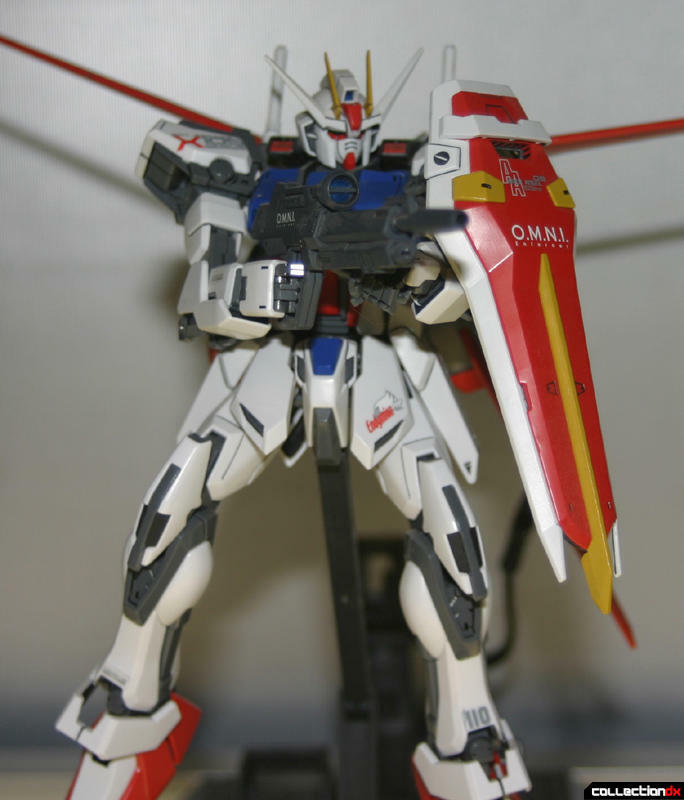 Out of the box, the Strike comes molded in its primary colors: white, blue, red and yellow with the additional gray plastic for interior parts and weapons. As for the “Aile Striker” parts are molded in the darker gunmetal gray with an additional red parts tree. Your average builder will be please to know that there is hardly any paint work to do. There are a few points such as the usual red-points inside thrusters and gray spots on the front of the skirts and back of the shield. The head of Strike is made up of nine parts. 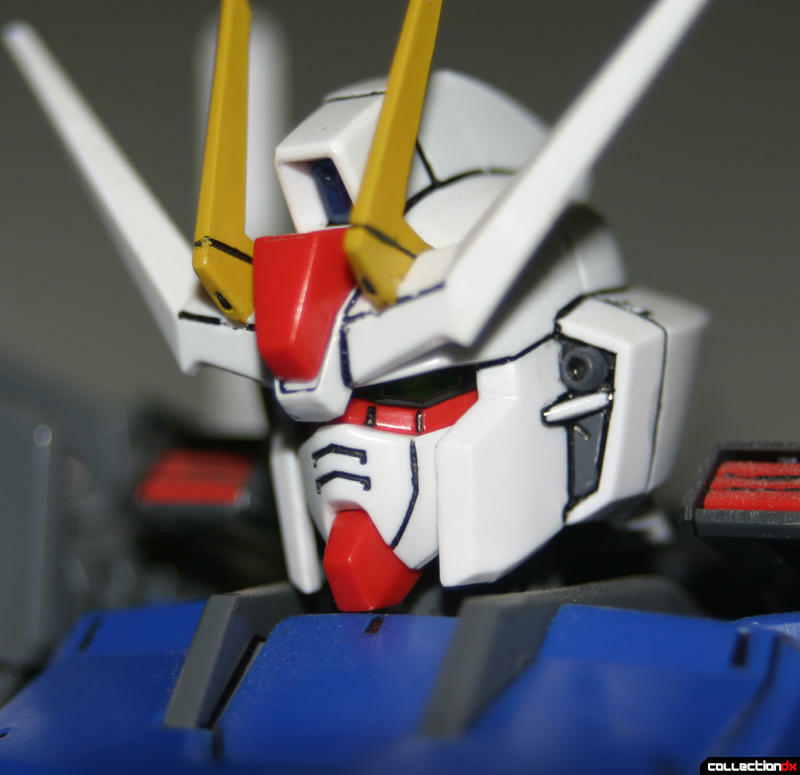 This includes the face (3 parts) head casing (2 parts plus polycap) and the ‘Gundam crest’ (3 parts). Detailing is very streamlined and done to above the initial character value. Paint work includes the gun barrels for its ICWS machine guns and the vents on the back of the head. The mold of the parts is really good and tight. 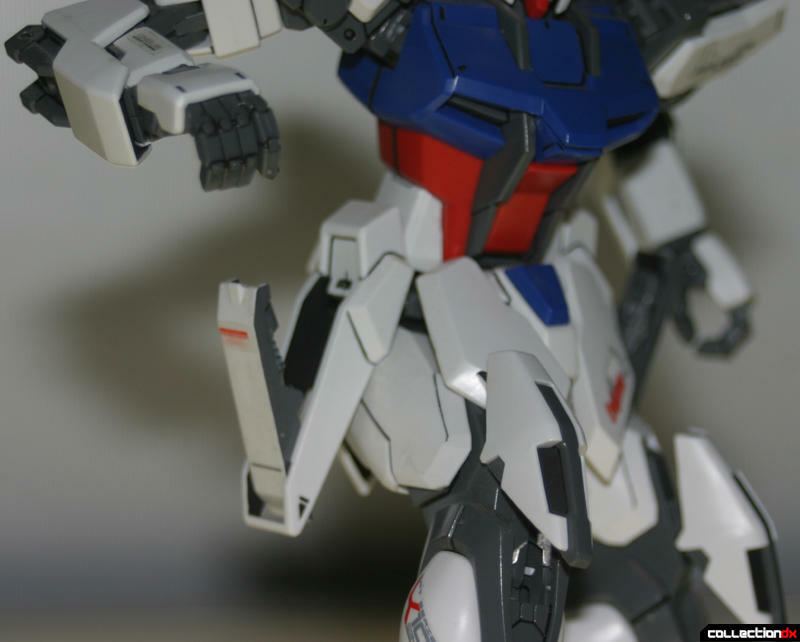 The torso is a solid assembly with the armor plating done around a central subassembly. The neck is one solid piece and is mounted on a swivel point to raise the head up or down. The cockpit is built into this as a box which fits inside. The pilot figure comes separate and unpainted and needs work; I painted mine like the Strike’s late pilot Mu La Flaga. 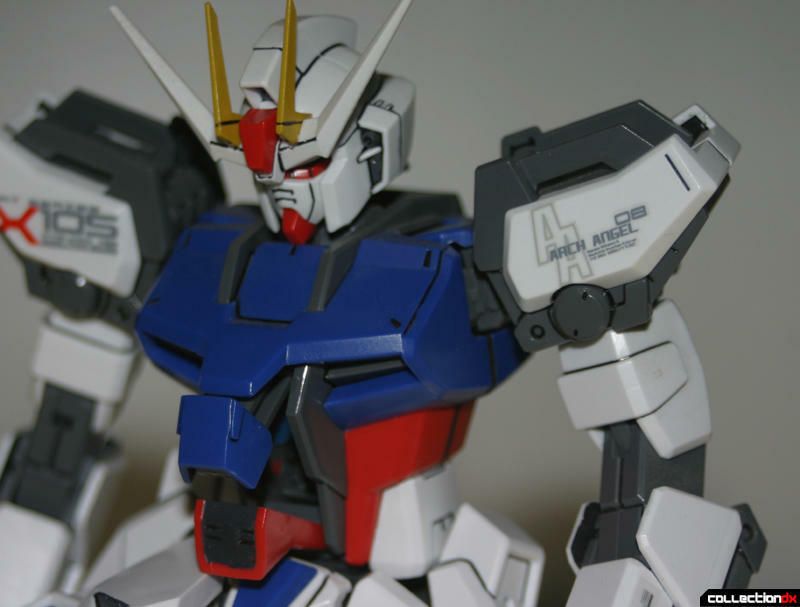 The shoulders of the kit are a new simplistic articulated assembly. This acts as a fixed rotary block and allows the arms of the model to have an enhanced range of motion and flexability. Finally, as always the cockpit can open and close, but in the Strike’s two door housing. The hip section of the Strike is very loose fitting but snug. 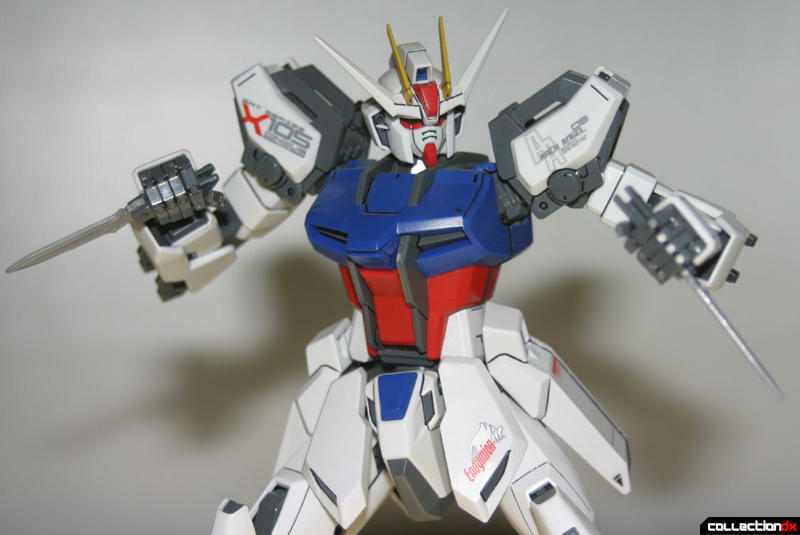 It features the standard of Gundam with its interior section with polycaps for side armor and the main ball joint socket (for the torso). The additions for the Strike’s unique launch base though include a secondary polycap in the back of the rear skirt and another polycap at the base of the tailbone underneath. The rear skirts are hinged and are held in place by a rear block piece. On the front however is something different, the absence of a front skirt polycap. Instead the sockets are done in the undercarriage and front block. This sounds problematic because of the threat of plastic on plastic friction, but there is no weight to cause any. The last parts of the hips are the side containers. Because they hold the Strike’s back up weapons, the Armor Schneider, they can open and close. The arms of the kit are really great. With the shoulder armor separate and the addition of the new shoulder mechanics, they have a higher range of flexibility. The biceps use a more advanced method of the HGUC style assembly with the polycap inside a housing piece that connects to the elbow. The elbows are double jointed to allow a better range of motion. The shoulders’ armor fits over the arm bar from the torso/shoulder mechanism and features a nifty opening shell. There is one questionable region at the top though; inserts for possible future Striker packs. Seeing how this kit is made with the AILE equipment in mind, these go unused. 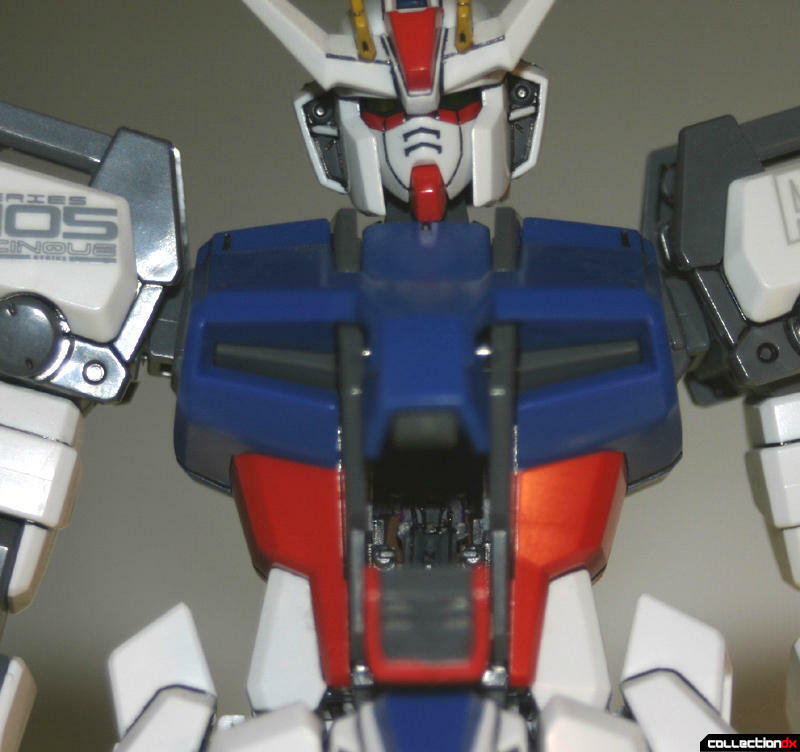 The hands in the kit are some of the best Master Grade hands, period. They have the plated knuckles of the Strike but also in crisp articulated detail that the 1/100 scale High Grade generation lacked. The legs of the Strike are done with the simplest amount of assembly with a healthy bit of good looking. Starting at the foot, the soles of the feet are done in full detail. They are separately cut; toe piece and heel piece with panel lines and with the thrusters molded into the heel piece. They are joined together on a simple hinge and polycap ankle to allow for a better degree of posing, and a more dynamic step. The legs themselves are built like the rest of the body with the inner frame making up the real assembly work with the armor just being plated on. There isn’t any real piston/joint system like Master Grades are famous for, but the detailing is good and articulation is as well. The knees are double jointed but the upper leg portion is on a very simple mock quadriceps. This can be seen with the armor plating being able to shift forward when the knee is flexed. 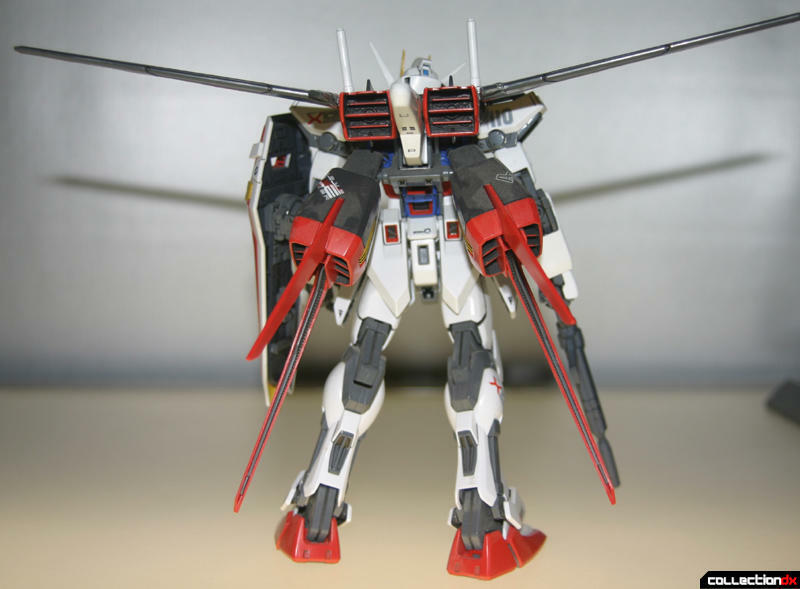 Essentially, the Strike Gundam is an all purpose mobile suit, not confined to a particular style or excessive gimmick and so it is complimented with any array of additional weapons known as Striker packs. From the start of the SEED series, it was equipped with three unique types: ‘SWORD’, ‘LAUNCHER’ and ‘AILE.’ The Aile pack is made for long distance flight and is the more notable Striker pack from the show. While it had been done in 1/100 scale for the High Grade incarnation, the MG Aile Striker was lacking in both accuracy and detail. The Aile pack is divided into two sections; the upper wings section and the lower thruster blocks. The wings were not even worthy of being stabilizers let alone primary wings. The MG version is how it should have been; WINGS! They are articulated wings to be exact, with a double hinge mechanism that allowed them to fold down. The dual rear blocks are also given some much needed detail with the tails having ventilation down the insides. The only pet peeve I have from this is that no matter how advanced Master Grade construction gets or no matter how detailed tiny parts can be, there is no such thing as a separated thruster assembly. The rear sections of the back boosters and thruster packs are done in red plastic and the detailed engines inside them are done in the same part. Painting can be a real chore if you’re looking for a real separation. The Strike comes with the bare essentials; shield, beam rifle and beam sabers. The shield is a more streamlined variation of past SEED shields, less bulky and with a new mounting assembly. The mounting assembly is a down graded version of what is now on Perfect Grades; two plates that either fit flat on the back of the arm or fold the shield around to the side of the forearm. It also comes with the basic grip handle that fits on pegs. The rifle is another modified piece of weaponry; it’s thicker and longer than the prior versions and also sports a clear lens piece. Its detailing is worthy of the new MG treatment. The sabers that come with the Aile pack are more narrow and longer than those of the 1/100 scale but compliment the new sleeker look of the MG kit. Finally comes the one feature weapon of the Strike’s basic arsenal; the Armor Schneider. These two folding daggers are stored in the side pockets and are an actual folding blade which really makes for good toyetics. I like to think that Bandai’s having fun with giving new ways to display models: the PG GP-01 with its hangar assembly, the Zeong with its ‘pyramid’ or even the EX-S with its slab. The MG Aile Strike comes with its own piece of its hangar away from home. The launch base is to be a simplified replica of the launch pad inside the Archangel. It sports a set of foot blocks that slide back and forth and a raised block in the rear which holds the Strike’s battery cables, with REAL cables! Sadly though these aren’t electrical but the steel wire cables are flexible and hold their shape when disconnected from the rear of the Strike. It also features an additional raising arm that fits into the polycap in the undercarriage of the hips to put the Aile Striker into the air. On a side note from later builds, this action display base is also compatible with the Master Grade Freedom Gundam. However there is no port on the back of the Freedom to connect the battery cable. While this was a tie-in in for the popularity of SEED, a lot of genuine Master Grade love went into this kit. This can be seen through the amount of decal work. From basic ‘CAUTION’ marks to tags unique to the Strike. The Dry transfer decals in this kit are very different from the normal ones seeing how the word markings are almost one solid sheet rather than being separate letters. This made application to those that bend around corners extremely easy. The ‘correct’ application really shows how much the Bee-Craft crew had fun with their work. The only unlisted decal of the dry transfer series that is a real show of the pilot is the “ENDYMION” which comes from the last pilot, Mu La Flaga. Albeit a simple kit, the Master Grade Strike fills in all the desired gaps from Bandai’s work with the design and the SEED series. It combines the character of the MS but also has some nice new generation toyetics from the Master Grade line. On the downside, Bandai has all but given up on making the additional Striker packs in MG form. For those, Bandai relies on B-Club to make adapter parts that use the original 1/100 scale High grade versions. Even so, the Strike Gundam is another welcome addition to the Master Grade collection.